Last week I went to see Kiss Me Kate. I saw a dress rehearsal production of it a couple of years ago, but this was the full on real deal, and it was really good. I told my mom I was going, and she sounded more than a bit envious. She had an afternoon of paperwork ahead of her, while I was off to watch three hours of musical theater. You see, my mom loves musicals. She was a teenager in the 1960s and only has one Beatles album, BUT she owns almost every Broadway musical album from 1950 - 1970. When I was 5, I probably knew all of the words to every song in Showboat. I've also never seen the Disney animated version of Peter Pan. Just the recorded BBC version with Mary Martin. The musical apple doesn't fall far from the tree. So Mom, I made this silly watercolor doodle for you. Happy Mother's Day. 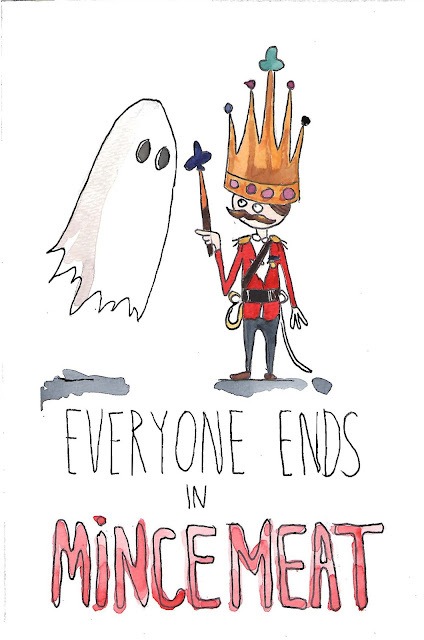 A silly illustration of a couplet, neatly summarizing Hamlet.